This amazingly lifelike, fully iced Canon Camera inspired Custom Birthday Cake is picture perfect. A custom built piece of cake art, complete with edible knobs, buttons, lenses and straps associated with a top class SLR camera. 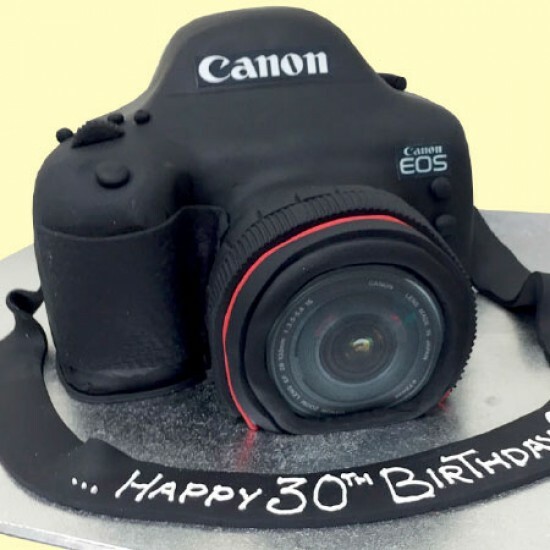 This amazingly lifelike, fully iced Canon Camera inspired Custom Birthday Cake is picture perfect. A custom built piece of cake art, complete with edible knobs, buttons, lenses and straps associated with a top class SLR camera. This hand-made Canon Camera Cake comes in Chocolate Mud flavour and even has a space on the strap for our talented team to write a personalised message to the birthday boy or girl.